Why They Work: One word, monochromatic! Flowers within the same color family with different textures really work well together. Monochromatics brighten up a room without looking mismatched. How to: Trim the bottom of the heather and make sure to remove any of the lower petals that will sit in the water. Add bunch to vase. Cut gerbs and arrange individually, using the heather to hold the top-heavy daisies in place. Insert some flowers at an angle to get a well-rounded bouquet. For interest and texture, make sure heather spikes sit up above the face of the gerbera. Add in touches of greens for balance and form. For a clean addition, add green trick to the mix. 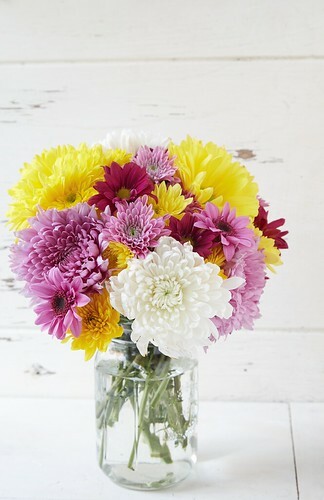 Why They Work: Both varieties are from the chrysanthemum family and are very showy. Alone each bunch is decently sized, but for the price you cannot find a bigger bunch of showy flowers. Both varieties will last a long time, so this makes a great no-fuss mix that always coordinates. How to: Trim the bottom of the daisies and make sure to remove any of the lower petals and leaves that will sit in the water. Add bunch to vase. Cut football mums and arrange individually, using daisies to hold the mums in place. Insert some flowers at an angle to get a bulky, well-rounded bouquet. Why They Work: The daffodil stands alone. When cut, these flowers release a sap into the water that can clog the capillaries of other flower varieties and block water uptake, essentially starving the flowers. 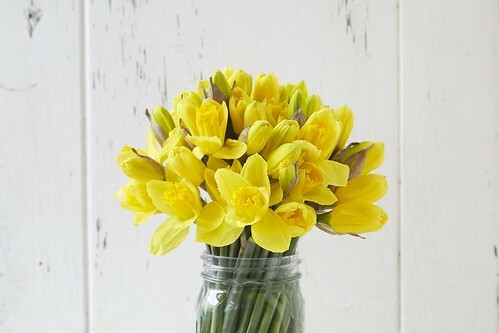 Daffodils don’t play well with other flowers but they do make a great bang for your buck as a single variety arrangement. Each bunch contains 30 stems so x2 you have a really nice sized spring centerpiece with virtually no work. Since FreshDirect’s daffodils are delivered very tight to promote a longer vase life, we recommend receiving the flowers at least 3 days before an event for desired blooming. Why They Work: When I worked for a popular New York City flower provider, green tricks were all the rage for upscale events and clients. Alone they range from ping-pong to golf ball size, but massed together you get a chic clean look with minimal effort. Green is “floral neutral” and will match virtually any modern décor or color scheme. As a bonus, our green trick are very long lasting! How to: With 20 stems of green trick you will need a container with a fairly narrow opening. Separate each stem and remove lower foliage. Bunch together in your hand first, criss-crossing the stems to get a wider bouquet. 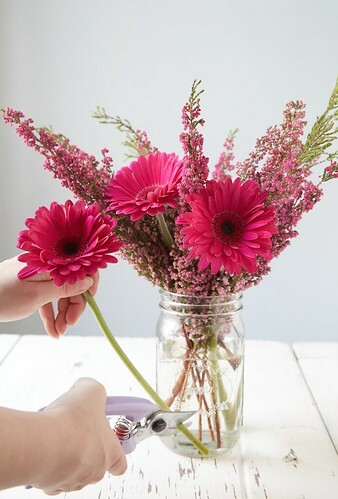 Measure the bouquet against the container for height, then snip the ends and place in the vase. Fun fact: Dianthus is actually the botanical name for carnation. 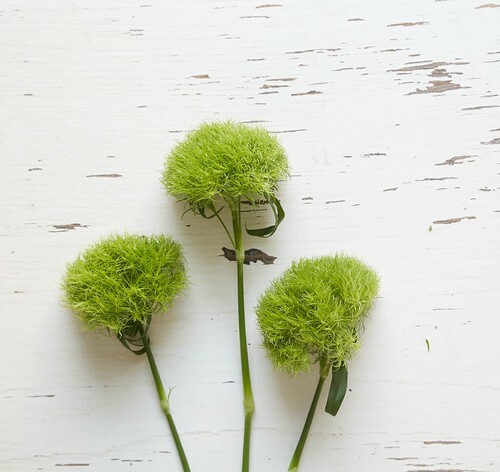 Green trick dianthus are actually a first cousin of both the traditional carnation and brightly colored sweet William. See more pretty arrangements and buy fresh flowers here.